The high-performance 32-bit AVR microcontroller is designed for cost-sensitive embedded applications that require low power consumption, high code density, and high performance. The device includes USB Full-speed device interface. 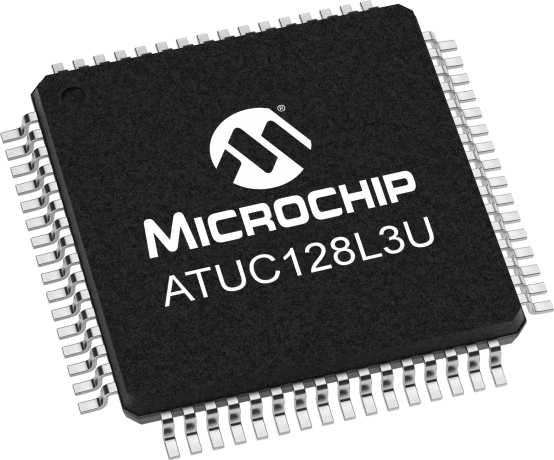 The microcontroller's Memory Protection Unit (MPU) and fast, flexible interrupt controller support the latest real-time operating systems. The Secure Access Unit (SAU) with MPU provides enhanced security and integrity. Higher computation capability is achieved using a rich set of DSP instructions. The microcontroller embeds state-of-the-art picoPower technology for ultra-low power consumption. Combinations of power control techniques bring active current consumption down to 165µA/MHz and leakage down to 9nA while still retaining a bank of backup registers. The device offers a wide range of trade-offs between functionality and power consumption to reach the lowest possible power usage for the application's required feature set. The UC3-A3 Xplained evaluation kit is a hardware platform for evaluating the AT32UC3A3256 microcontroller. The kit offers a range of features that enable the AVR UC3 user to get started using AVR UC3 peripherals right away and understand how to integrate the AVR UC3 device in their own design. NOTE: The UC3-A3 Xplainedis suited for evaluation ofboth UC3A3 and UC3A4 microcontrollers. The UC3-L0 Xplained evaluation kit is a hardware platform for evaluating the AT32UC3L064 microcontroller. The kit offers a range of features that enable the AVR UC3 user to get started using AVR UC3 peripherals right away and understand how to integrate the AVR UC3 device in their own design. NOTE: The UC3-L0 Xplained is suited for evaluation of both UC3L0 and UC3L4 microcontrollers. Evaluation kit and development system for the 32-bit AVR AT32UC3L064 microcontroller. The kit is equipped with a rich set of peripherals making it a perfect evaluation platform. The ATmega168PB Xplained Mini evaluation kit is a hardware platform for evaluating the ATmega168PB microcontroller. The evaluation kit comes with a fully-integrated debugger that provides seamless integration with Atmel Studio. The kit provides access to the features of the ATmega168PB enabling easy integration of the device in a custom design. The ATmega328PB Xplained Mini evaluation kit is a hardware platform for evaluating the ATmega328PB microcontroller (MCU). The evaluation kit comes with a fully integrated debugger that provides seamless integration with Atmel Studio. The kit provides access to the features of the ATmega328PB MCU, enabling easy integration of the device into a custom design. Routing card for 48-pin AVR UC3 B1 series in TQFP and QFN socket supplements the STK6000 Starter Kit. Shipping Weight = Device Weight + Packing Material weight. Please contact sales office if device weight is not available. For pricing and availability, contact Microchip Local Sales.